Nope, I'm not referring to the weather (over 12 inches of rain in the past 6 weeks) but to milk. It's customary to dry up a dairy goat about two months before she kids. Daphne is hopefully due at the end of February, so December is the month to dry her up. Actually, she dried herself up. Milk production just dropped until it was less than a cup per day, so I stopped milking. I've had this happen with mature does before and can't help but wonder if they know they need to do this for the kids growing inside them. I admit that it's nice to have a break from milking, but I'd still like to have a year-round milk supply. This is mostly to keep my kefir alive, but it's also nice to have extra to feed the pigs. On top of that, I was in the middle of experimenting with quick cheeses, and had to stop when the milk stopped. Cheese is the traditional way of preserving milk. Happily, this year's came out very well (so far). I found a neat little book at the library entitled One-Hour Cheese by Claudia Lucero, and it's been fun working through the quick cheese recipes. I think quick cheeses would be wonderful for my summer cheese making, especially considering how much trouble I seem to have with my hard cheeses (wax cracking being the latest - with both bees and cheese. More on that another time). One to the thing I love about Kinder goats is that they can go into heat any time of year (aseasonal breeders). To ensure a year-round milk supply, all I have to do is breed them at different times of the year. Before I sold her, I intended to keep Helen in milk until Daphne kidded. But I think seven does is too many to overwinter, so Helen was the one to go, which leaves me milkless. So Daphne should kid at the end of February, with four of my first fresheners due in April and May. Those will be my busy months, hopefully. I don't do pregnancy testing so we'll just have to wait and see. I'll save Violet for a late summer or early fall kidding. That will hopefully ensure next winter's milk supply. At least that's my plan. Only time will tell as to whether or not the goats will agree to cooperate. I so miss my goats and coming up to kidding is such an exciting time! Those are two good signs that they are! Thanks Gill. It would be lovely to have an uneventful kidding season. 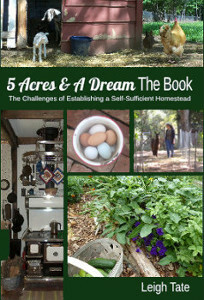 I love to find a '5 acres' post when I get up in the morning and start breakfast while Ralph takes care of the Chickens. We have yet to find a milk goat but we were just discussing cheese and making it! The book you mentioned sounds like it should be in our library. God Bless you and your farm. I love the quick cheese concept. Boiled milk cheese is my only no-enzyme cheese so far. I was planning to breed my girls this month, but something has come up that will make me want to wait. I will have to wait. I just saw the One-Hour Cheese book advertised and wondered if it would be a good one to have. Now I'll buy it! The picture of your cheese in this post looks WONDERFUL. Also your pretty girl, Violet! I couldn't imagine staggering my ewes. I want em popping those lambs out as close together as possible so it's over with and I can get back to work. This year I thought about going out there and holding a couple of the ewes so the rams could get their job done in a timely fashion. One of the rams probably wouldn't have cared but the other one might have gotten a bit possessive though. Another week and the ewes get liberated. Ok - So Mark just got a blinding glimpse of the obvious. Not about drying up critters before they kid (or calve in my experience). Been there and done that. "Cheese is the traditional way of preserving milk." I grew up a beef farm, but we usually had a copy of Holstein-cross cows that produced pretty good freezer beef and that we hand-milked a good part of the year. We made butter a few times, mostly just for the experience of doing it, but usually extra either went to the pigs if we had them or got popped into the freezer for times when the cows were dry or we needed a bunch of extra for baking or cooking. My thinking has kind of been "Milk is milk because that's the way to get it from the cow or goat, and milk is made into cheese because you like cheese. I probably should have figure the preservation thing out a long time ago, bujt it's all good. Thanks for and interesting post. I accidentally made a boiled milk cheese not too long ago and was really pleased with it. I salted it and left it in crumbles. Really nice for cooking or sprinkled on anything. Sorry to hear you had to postpone your breeding plans. Such is life, sometimes. I'm really pleased with this year's cheese! Which reminds me that I need to go turn my cheeses. I figured out that one of my problems in the past was not turning them often enough. I highly recommend the book and may end up buying a copy myself. I think that's usually the way it is with sheep and meat goats, isn't it? But if you had to milk them all ... !!! I have on a couple of occasions been forced to milk a ewe because she rejected a lamb. It is something I pray I never have to do again. I try and give the new lambs at least a little of it's own mothers colostrum if at all possible rather than using the store bought kind so I am sure it will happen once again. That is a good looking round of cheese. (round is probably the wrong word to use). I would love to know how to milk a goat and make cheese. Wow. Leigh. I hope that cheese tastes as good as it looks! That cheese looks absolutely amazing, I'd love to try some of that! So I've been reading "Critter Tales" and am looking for your opinion. We are thinking about either getting goats or pigs next, but honestly after reading your book goats sound like a lot more trouble than pigs. Any thoughts on which to get first and why? I know some cheeses are made of sheeps milk, but I'm guessing a ewe would not have large teats and would therefore be difficult to milk. It's good you do that for the sake of the lambs though. It's a good 'un and I only hope all the rest are just as good! Nancy, I've tried to freeze milk but haven't been entirely satisfied with the results. It tends to be grainy when it defrosts, but I'm not sure if it's because its raw, or maybe something else. The other thing about freezing milk is that it takes up a lot of room in the freezer. Well, I don't think everyone has had as much trouble as I have. :) I think too, that a lot of it has to do with breed. Two breeds I would not have again are Kikos and Nubians. They have been more trouble than any other. The Pygmys, Nigerian Dwarfs, and Kinders are much easier to deal with! One consideration is how important dairy is, because you can't get that with pigs. Both of them require good fences. You read about Elvis, but he was an exception. Still, horned goats can get horns caught in fences. Also all goats love to lean into fence to scratch their sides, which is pretty rough on welded wire. (Woven would be much better). Pigs tend to test and push fences and with the bigger breeds that could be a problem. Piglets tend to push their way under gates and high spots under the fence. I'm less experienced with pigs than goats, but breed selection with either is important. The American Guinea Hogs are very even-tempered, but I understand some breeds can be more aggressive. The seem to be hardier than other breeds which means easier care. Pigs will be "harder" on the ground however, because they love to root. If you need natural tilling, they do an excellent job. If you don't want them tearing up good pasture, you'll have to feed them well. They are excellent garbage disposals and will eat things goats won't. Both species are endearing and entertaining. Their natural tendencies are different, so the question you'll need to answer is which one suits your current set-up. Let me know what you decide! Thanks for the response! We were looking at either the kinders or the american guinea hogs. Our real problem is lack of pasture. We live in the woods on a bunch of hills. 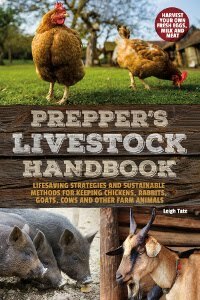 Originally the plan was to have goats help clear some invasive plants (bush honey suckle and eastern red cedars) but I got the impression from your book that goats would also require a lot of hay that we would have to buy. While the pigs would not help with eating the invasive plants, they seemed to be less picky on what else we might be able to get together to feed them. Both goats and pigs do really well in woodland areas. Goats thrive on the browse and, as you say, help clear unwanted plants. Of course, there's less browse in winter and that's when they need hay. Eventually they clear out the brush and usually end up on pasture after that. Pigs will work at ground level, and find a lot to eat by rooting. American Guinea Hogs do well on pasture too, and will graze grass and clover. They are also great disposals of all kinds of kitchen and garden waste. I look forward to what you decide. You've chosen great breeds! Dining Room Windows - 1st One In!